a time for walking and a time for falling down…. Today I was ready to be on my way and after breakfast set out on the road to Beal, and then Holy Island. The sky was a marvellous shade of grey and the breeze was cool. I wore running shoes, not boots, since today would mainly be road walking. My blisters are so much better. Upon reaching the sea, I spoke to a man with two black labs who pointed the way of the pilgrim route across the sands. I made my way there, took off my shoes and socks, and stepped onto the sandy ocean floor. 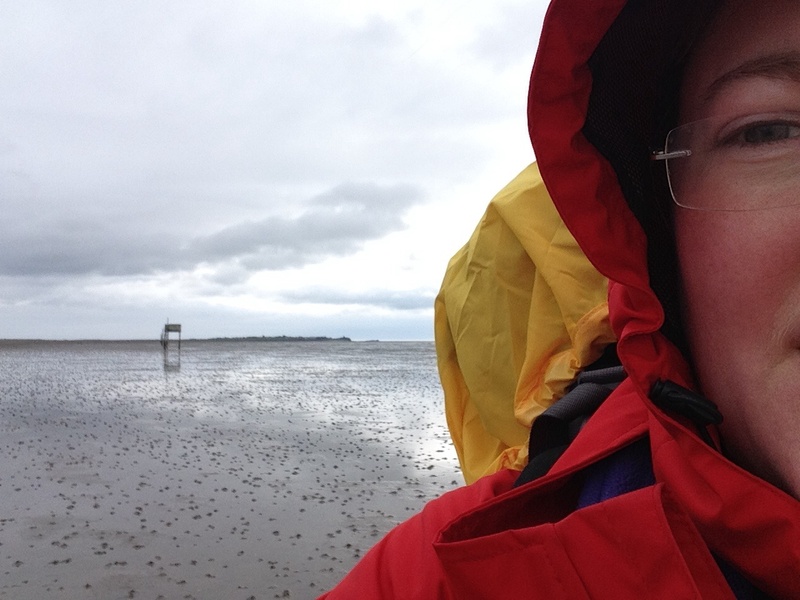 The tide was out, but it was wet and very, very cold. For a few moments I thought I would not be able to stand it, but I zipped up my jacket and with the rest of me warm, my feet seemed fine. Underneath me was sand and water, uneven and lumpy. Ahead of me was a line of poles that would guide me to the island. Now with my pack on my back again, I chose each step carefully. When I reached a place where the sand was soft, I slowed my pace and followed the other footprints. That’s when I fell. I stepped onto sand and it gave way. Suddenly I was halfway to my knees in not just mud, but in the black, smelly ooze underneath. I toppled to one side, losing my balance completely and managing to smear my legs, pants, jacket and hands with dirt. I laughed out loud at myself. Taking great care, I lifted one foot onto more solid ground, and then the other. Oh my, but I was a mess! I did my best to rinse my feet in a pool of clear sea water and wipe my hands on a small patch of grassy plants. Then I made peace with being dirty. Not much could be done about it now, anyway! The trip across took only a couple of hours, with me walking at a leisurely pace. It was quiet on the flats, but I was not alone. Three men passed me silently mid-way through. On the shore again, I rested with water and a biscuit. 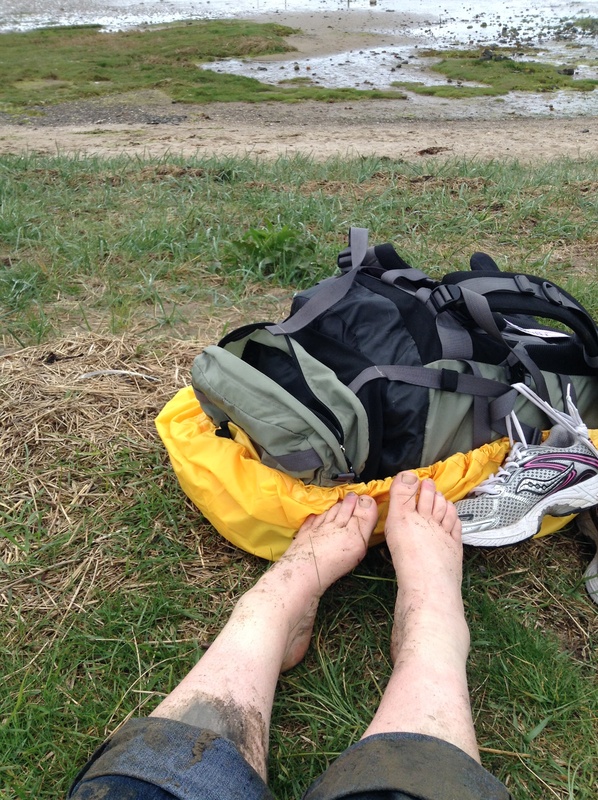 I let my feet dry out and put my boots on again, which felt warm and good. I noticed that there were a huge number of cars driving across on the causeway and realized that it is the Sunday of a long weekend here. I have been alone, or at least in my own world, for many days. Now I return to community. It will take me a little time to adjust, I think. I can’t just blow my nose sans kleenex anywhere I like now! But as I have often said about Ecclesiastes 3 (“For everything there is a season…”) all of life has a certain flow, a back-and-forth rhythm that makes our journey rich, deep and full of texture. Today, my last day as a pilgrim, I embrace that rhythm in all its fullness. Sun and cloud, singing and silence, walking and resting, standing and falling, clean and dirty. Each one of these held in tension, working together, beautiful and blessed. 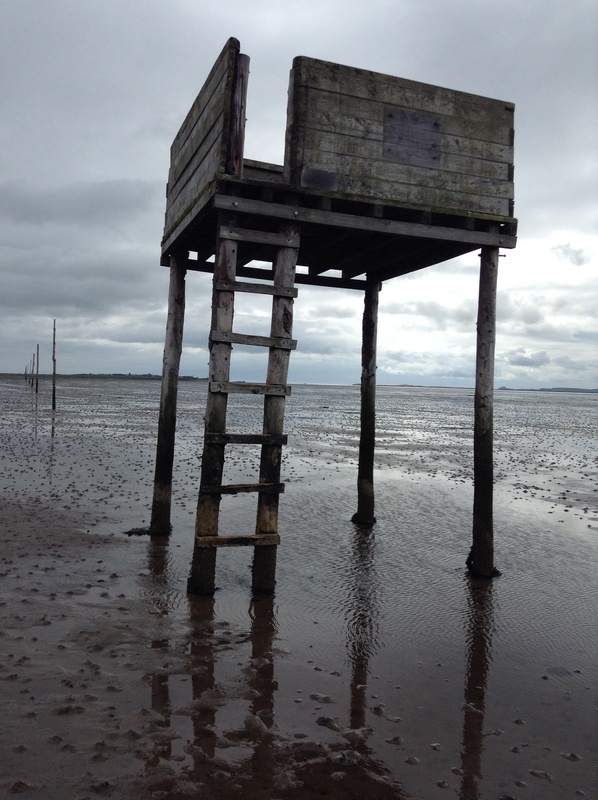 This entry was posted in Uncategorized and tagged Lindisfarne, pilgrimage, seasons, St. Cuthbert's Way. Bookmark the permalink.